In 1925 many Presbyterian, Methodist and Congregationalist churches across Canada voted to combine as the United Church of Canada. However, a significant number of Presbyterians decided to remain independent of the union. Occasionally they occupied their existing church buildings, but in other cases they built anew. 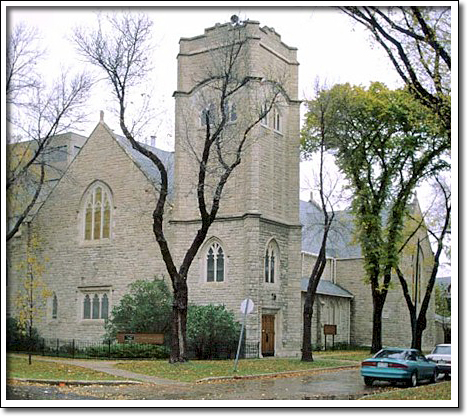 Presbyterians from several churches in central Winnipeg joined to form a single congregation and built First Presbyterian in 1927. The notable Winnipeg architectural firm of Pratt and Ross, along with James McDiarmid, volunteered their services to the congregation. Their design is one of the best, and one of the last, large churches in Manitoba built with an appreciation for the Gothic Revival style. The rugged nature of the style is expressed through the use of stone, while its picturesque qualities are manifested in the details of the stonework and in the variety of shapes of sizes of window and door openings.